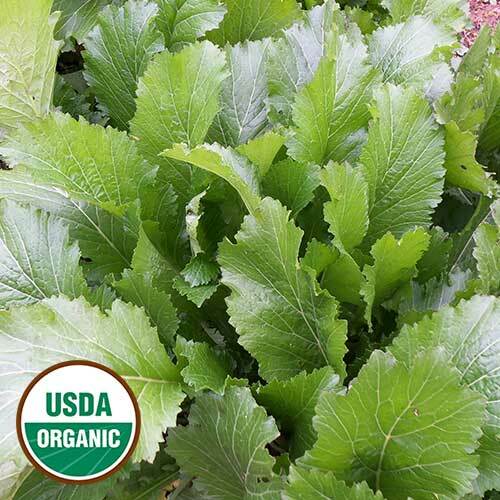 This heirloom variety’s leaves have the classic spice and sharpness of a good mustard green, and are more substantial in texture than other leafy greens. The glossy, highly toothed leaves gently cascade downward, making them an attractive addition to the vegetable garden. Jim Tjepkema received the variety from fellow Seed Savers Exchange member Dorothy Jones in 1990 and later donated it to our collection. The variety’s lineage can be traced to Georgia in 1839, through Dorothy’s husband’s ancestors. You can directly seed your mustards into the ground, placing 3 seeds every 8 inches. Plant them 3 months before your first frost in rows 18-30 inches apart. The seeds should be planted 1/4-1/2 inch deep. As they grow, thin them to 1 plant every 8-10 inches. Mustards may bolt early if planted in the spring.